Multipoint (also known as full) door locks or bolts are usually installed in uPVC plastic doors. They are long, thin, and have several small locks - these comprise of a central locking mechanism and additional locking devices such as hooks, deadbolts, pins, rollers and mushroom cams, which go up the length of the strip. Usually, if installed on a front/back door, a multipoint lock is locked by lifting up the handle to engage the locks, but other operations are available. DOOR LOCKS - WE WILL FIND IT FOR YOU! 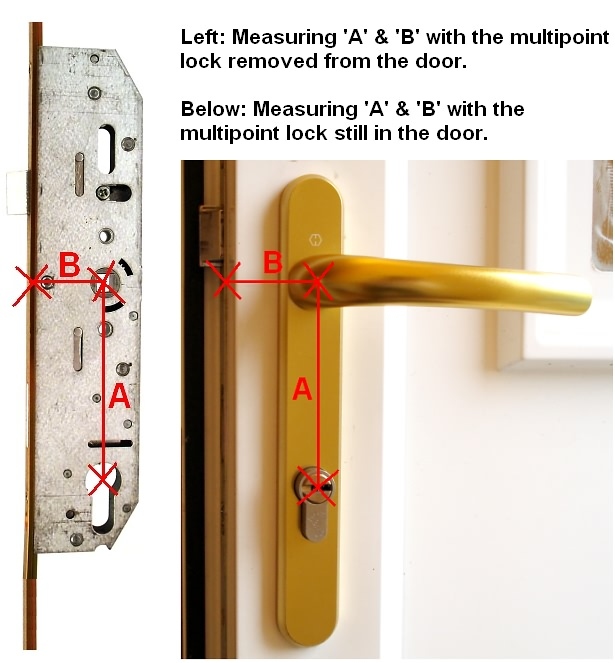 Tell us the dimensions in mm (for A and B), and, if possible, the make (name or logo) - this can be located on the main multipoint door lock metal strip that runs the full length of the door - also tell us if the locking system has deadbolts, hooks, or rollers to lock. AVOCET, COLDSEAL, ERA, FUHR, FULLEX, GU FERCO, KFV, LAIRD, LOCKMASTER, MACO, MILA MASTER, MILLENCO, ROTO, WINKHAUS, YALE and many more. SEND US PICTURES OF YOUR LOCK! - You can email us at: sales@dgpruk.com to enquire about any multipoint door locks you are looking for as we only show the most commonly used door locks on our site - we are sure we will be able to help with any questions you have. FERCO Lever Operated Latch and Deadbolt - 20mm Faceplate - 2 Small Hook (tongues)The old style lock ..
GU Lever Operated Latch & Deadbolt - 2 HookAvailable Backsets:28mm Backset, 35mm Backset & 4.. The MILA Master lock is an extremely versatile lock which can be utilised for all common application.. The MILA Master lock, featuring 2 hooks and 2 rollers, is a high security multipoint lock designed f.. The Mila Master 2 roller extendable lock is a multi-point lock designed for use on residential doors.. The Mila Master 3 deadbolt lock is a high security multipoint lock designed for residential doors.Th.. The Mila Master 4 roller door lock is a multipoint door locking system for all types of doors. The m.. The Mila Master Slave Door Lock is designed for use on the slave leaf of a pair of french doors. Sho..
NOW DISCONTINUED, LIMITED STOCKThis replacement SI Siegenia Tilt and Turn Drive Gear Window/Door Loc..
CHAMELEON 4 Roller Repair Lock Kit - Single SpindleThe Chameleon 4 Roller Repair Lock Kit is supplie..
CHAMELEON 4 Roller Repair Lock Kit - Split SpindleThe Chameleon 4 Roller Repair Lock Kit is supplied.. This replacement Non-Branded uPVC Door Lock has a 35mm Backset and measures 117mm from handle t..